Recently, A La Carte Kitchen and the Gardiner Museum threw a shing ding to showcase their catering and event execution expertise. Well clad museum patrons/donors, food bloggers and young museum lovers all gathered in the spacious venue while serenaded with fabulous music. 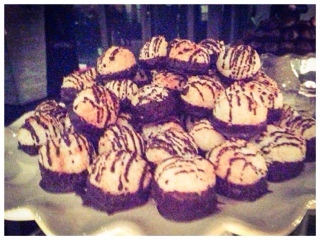 After a successful dinner at A La Carte Bistro, the restaurant that operates on the third floor, I was intrigued to experience an event and sample their catering eats. Luckily for me, there were plenty of food being passed around; it seemed like every moment a platter of enticing bites were in front of me. 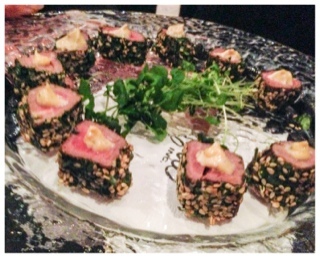 Such as bites of sesame crusted beef tenderloin with a dollop of flavourful mustard. 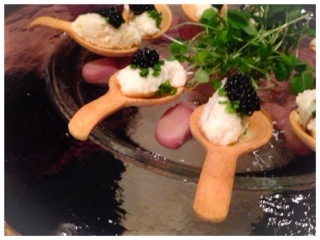 Decadent goat cheese and caviar spoons, a lovely texture of soft creaminess and pops of saltiness. And a great aromatic crêpes filled with the same creamy goat cheese mixed with crushed pistachios (a delicious combination). 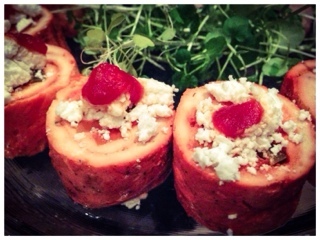 Then there was the dense chicken roulade filled with diced sweet peppers, a relish and topped with crumbled cheese. 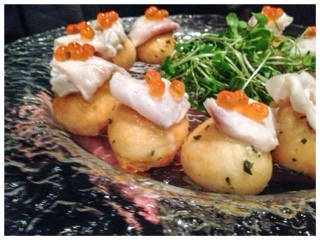 A herbed bite of dough topped with rehydrated salted cod and salmon roe. 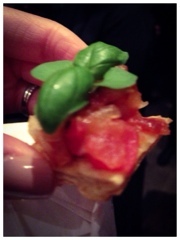 For the vegetarians a phyllo tart topped with bruschetta and beautiful baby basil. Or bundles of salad tossed in a vinaigrette and tied with chives. But my favourite was the lobster roll. 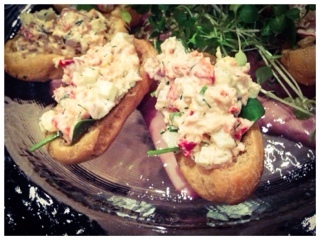 Filled to the brim with succulent lobster and stuffed into a savoury choux pastry which held it's shape and added an airy crispy texture to the creamy lobster mixture. 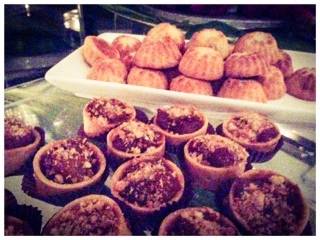 But, the event wasn't all about the food. There was plenty to sip on as well. 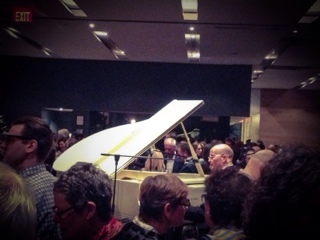 In fact, based on all the laughter permeating the room, it seemed that people were sipping on plenty. 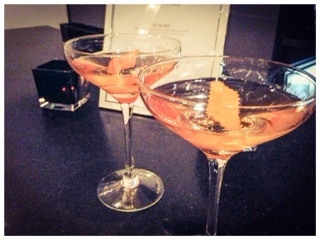 I tried the Copperface made with Absolut Elyx, a copper distilled luxury vodka. Mixed with apple and apricot brandy then rubbed with orange rind it really helped to balance out the strong drink. Plenty of wine was also being poured. I struck up the most interesting conversation with, Mikel, a representative from WBG Wines Basurato & Garcia that was showcasing delicious Spanish offerings. Sadly my picture didn't turn out very well (guess I may have sampled a few too many). But, I thoroughly enjoyed the Bellori Joven 2013 which was an easy drinking wine - dry but still have hints of fruit to it. It was a delightful night with any wineries in attendance where we had the ability to sample items that may not be found in the LCBO. 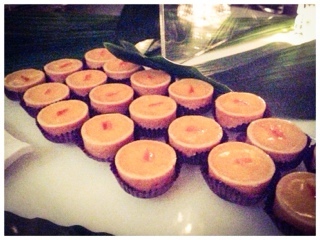 The night ended on a sweet but somewhat hazy note with A La Carte's dessert station. 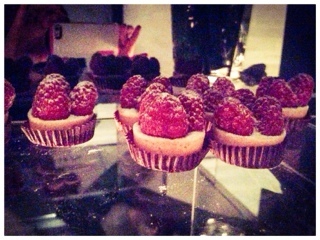 The raspberry tarts went well with my remaining pinot with its crisp tarte, creamy filling and plump sweet raspberries. Both Gardiner Museum and A La Carte Kitchen helped portray what an event could be like at their venue. Everyone was having a blast and didn't want to leave - it was supposed to end at 8pm but by 10pm people were still mingling around. That's what makes a successful night, throwing an event that's so lovely and relaxing that individuals want to hang around like its as comforting as their homes. 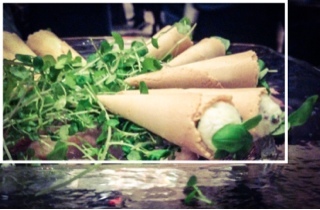 For a great recap of the event's atmosphere and experience, head over to #Parv's blog to find out more!